How can I replicate the portal 2 style of music? So I've been trying to replicate the sounds and synths from portal 2 for a while now and I've had no luck. Can anyone help me with this, I specifically need all the sounds from this video https://youtu.be/Ne-9SsZYWbY (It shows most of the portal 2 synths in the track). The one thing I know is that all of the synths in that video were made in Bob rapens predator 2, So if anyone knows how I can recreate the sounds in predator 2 please let me know. Re: How can I replicate the portal 2 style of music? Hello, glad to see another creator trying to figure out how to make Portal 2 sounds! Honestly I was pretty much doing the same thing, just listening to the soundtrack and trying to analyze what elements were used in it. However, a huge portion of P2 soundtrack also includes heavily processed audio bits which are almost impossible to recreate perfectly, so the closest thing we can do is to use similar techniques to achieve similar results with our own source audio. So I mainly focused on using the elements I knew how to recreate (or at least create something that sounds close to the original). The first synth that everyone asks about is the famous Portal 2 sync lead. It’s the lead melody sound I used in the track The Escape Pod (by the way, thanks for using my track as an example, it’s very flattering) as well as in many official Portal 2 tracks. Mike confirmed that the sound is in fact a preset from NI Pro-53 synth (and if I remember correctly, it’s the default patch). Since that is a VST plug-in and back in 2015 Reason (the software I use to make music) did not have VST support, I wanted to find a way to recreate it with the tools I had. One of the synths I have is Rob Papen’s Predator, that you’ve already mentioned. It is not really important that I used Predator, because the original sound is coming from a different synth, but what’s important is that Predator has a couple of features that allowed me to recreate the sound. So even if you don’t have Pro-53 or Predator, you shouldn’t feel like you 100% need them to get the similar result. Sure, you could argue that each synth has little nuances from the way its filters sound to the oscillator waveforms etc. So yes, if you want to go for 100% replica, then I suggest you use the original synth: Pro-53. I’m just trying to say that you shouldn’t feel limited just because you don’t have that particular synth, because I also did not have it. The important part of that sound is oscillator sync. In case you’re not familiar with this term, it means that you have two (or more) oscillators. 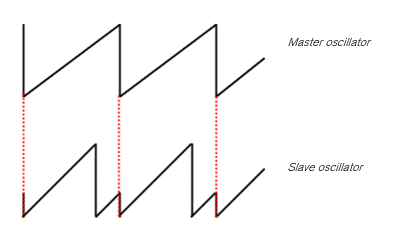 One of them is called ‘master’ and it is responsible for resetting the period of other oscillators (called ‘slaves’) when it finishes its own cycle. The trick is to change the pitch of the slave oscillator up and down, which would sound out of tune or like a siren changing its pitch. But since you are using oscillator sync, it sort of makes the note stay in place, but it drastically changes the timbre of the tone and makes it sound like it’s talking. Now that you know the theory, you can apply it to any synthesizer that allows oscillator sync. Do you use Reason? Perfect, there’s Thor synthesizer that can sync oscillators. Do you use a different DAW? Great, there are a lot of other synths that allow oscillator sync. I think Massive has a bunch of wavetables which emulate that sync sound. Predator has osc sync as well - that’s why I used it to make the sound. The oscillator waveform choice is simple - 1 sawtooth and 1 square wave, both synced to a 3rd oscillator. The pitch of sawtooth and square wave is modulated by mod wheel automation or an envelope (I used both in various parts of the song because in some parts I wanted to have more control over the sound). I then used a bit of delay and an EQ to take out the low end as well as get rid of some harsh and muddy areas to fit the sound in my mix. Another sound that people seem to ask me for is the plucky/beepy sound in the intro. I used two layers for it, one of them is a sampled Rhodes patch I found in Reason’s factory library. I lowered its decay to get a “glassy” pluck. The second layer is another Predator synth with the waveforms called “Glass” and “Octave”. I really wanted something that sounds like glass or a bit metallic, because that’s what the original P2 version sounded to me. The sound has short decay and a bit of release, and a low pass filter that is being closed by an envelope. The filter isn’t too drastic, it just filters out the highest frequencies (from around 2kHz up, but it’s got a very shallow slope). Then the sound goes through Predator’s widener to add some stereo width, and into a waveshaper. 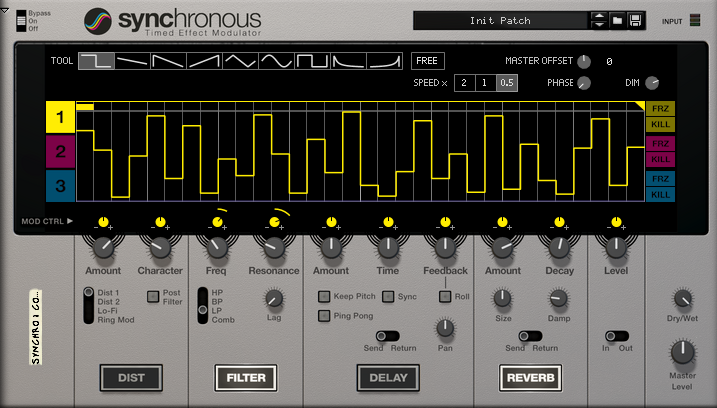 Then I run the sound through Synchronous, which is Reason’s modulation effect. But once again, it is not important that I used Synchronous, because you can achieve the same thing just by using a filter and modulation. The sound goes through a low pass filter with a bit of resonance, and the filter frequency is being moved rhythmically in a way “sample and hold” circuit would. Basically it’s a bunch of “constant lines” that vary in height and there are instant transitions in between them. This gives a lot of movement to the sound and adds to its characteristic. I also used some old chip emulations because those are a huge part of P2’s OST. The interview with Mike Morasky was done by Plogue, a company that made a plug-in called chipsounds. Mike used it in its production, so it makes sense that Plogue wanted to talk to him about how he used their product in a soundtrack like that. So there’s actually quite a lot of info on their website on which specific chips were used for what sounds. If you’re a Reason user, there’s a Rack Extension called Chip64 which also emulates some old console chips, but I think Plogue is probably the best choice (I just want to once again highlight the point that if you don’t have that exact plug-in, there are still other ways to get a similar result, but yes, it’s nice if you have access to the exact same plug-in). The buzzing bass sound is TIA 2600’s Buzz waveform with a bit of reverb on it. I layered it with another instance of Predator, which has the waveform Spec 16 as well as a sine oscillator used as a sub bass layer. It goes into Predator’s Low-Fi effect (which is just a bitcrusher set to 11.4 bits and the frequency is set to ~2kHz) to give it that old-school chiptune distorted sound. This pretty much covers all the synth sounds. I also used strings, horns, a bitcrushed kick drum and a bunch of glitchy processed percussion in the track. I could cover these too if you’d like. I was actually planning to make a video about me going through the project file of my Portal 2 tracks and explaining some of the things that went into making them. I’ve been busy lately (or lazy) so I haven’t got to making the videos yet. Hope that this helps! Let me know if you'd like me to explain something in more detail. Yes, Predator 2 has a low pass filter, it's probably called 24dB LP Type 1 (or other different slopes, like 12dB) - I'm just assuming that from the screenshot of Predator 2. You don't need the Rhodes sound at all, I've just used it as another layer to fill up the frequency spectrum. @fluppy- You said I could use a filter and modulator to get the same effect, are there any free ones that are available? I've looked and couldn't find anything useful. Same thing for the chiptune sounds. What DAW are you using? I would expect that every DAW comes with at least some sort of basic low pass filter... You don't really need any other 3rd party filter for that, and the automation can just be done manually in the sequencer. @fluppy- I use fl studio 20. And sorry for all the questions (I am very new to this style) but I forgot to also ask about how to make the glitchy percussion sounds.